Why not try this: On Saturday, wake up a bit earlier than you normally would. Slip out of bed quietly and get yourself ready. If you need coffee or tea, make it. If you need a shower, take it. Enjoy the silence of the morning and as soon as you feel like you can face it, shut the door behind you and head out to the store (but don’t forget to leave a note for your sleeping family, OK?). If you’re in a city, maybe the store is just the bodega on the corner. In the suburbs you might have to get in the car and go a bit farther. Wherever you need to go, go. And when you get there, buy some eggs, a can or two of pumpkin, some bread flour, yeast, and butter. Pick up a magazine if you’d like, or maybe even a candy bar. Treat yourself. This is all about treats. If you do this (plus what I tell you next), you’ll be eating warm pumpkin challah bread by early afternoon. Then, later, you’ll have slices of it spread thick with creamy unsalted butter at dinner. And Sunday? Oh Sunday is the best, because that’s when you’ll take what’s left of the bread and soak it in a batter of eggs and milk and vanilla, and fry in a skillet bathed in now-melted pats of butter. Serve it with this bacon. And then at night, when that bit of “oh tomorrow is Monday” sadness starts to creep in partway through your Sunday night shows, you can quickly bat it away by using all the crumbs and corners and maybe those tough last bits in the bottom of the bag to make a lovely pumpkin bread pudding. But, before all this, you’ll first need to make the bread. I’ve said before that I’m not good at simple recipes. I can’t really stick to the letter of anything. When I was in college I took a creative writing course taught by a bald man named Bernie who looked more like a trucker than a poet. He doled out assignments meant to instruct us on the basics, but I somehow always found a way to suit them to my liking. One afternoon he called me into his office hours and held a paper up to my face. “What is this?” he asked. I glanced at it and said it was, obviously, my poem. The assignment was to write a Shakesperean sonnet with 10 14-syllable lines in iambic pentameter. “This wasn’t what I asked for,” he repeated. This, my friends, is what you should tell the friends and family members in your life who are horrified with the idea of gussying up the challah with spices and pumpkin puree. “It’s fine as is!” They might shout despite your protestations. (Like with bagels and pizza, those who love challah tend to be very passionate about it.) And you might be tempted to agree. Challah, after all, is probably one of the best breads ever invented. Probably. The “plain” version, light and golden-hued with the faintest hint of sweetness, is pretty damn good. But take that pretty damn good recipe and add a bit of pumpkin and cinnamon and a few other nice things and Oh. My. Gosh. It may not be what you (or they) are used to, but that won’t matter, because it is good. So remember. This Saturday. Wake up early. Get the ingredients. Make this bread. Your weekend will be lovely. Combine the yeast with 2/3 cup of flour and the warm water. Whisk gently until well combined and leave in a warm (but not hot) spot to proof. In about 10-15 minutes, the mixture will look foamy and somewhat alive. This is a good thing. Pour this into the bowl of your electric mixer with the dough hook in place. Add the sugar, salt, oil, and egg and beat until well incorporated (about 1 minute). Add the pumpkin and all the spices, and mix until combined. Add the remaining flour, 1 cup at a time until the dough starts to pull away from the sides of the bowl. Depending on a variety of factors, your dough might require a bit more flour than listed above. Add this ¼ cup at a time until the dough is springy, but not sticky. Knead with the hook (or remove to a floured surface and knead by hand) for about 5-10 minutes. Roll the flour into a ball and place in a greased bowl. Turn the dough once to grease the top then cover with plastic wrap or a clean towel and leave in a warm spot to rise. I like to place it inside my (turned off) oven. The heat from the pilot is just perfect to keep it going—particularly on a drafty autumn morning. Let rise until doubled in bulk (about 1 hour to 1 hour and a half). Poke the dough down (no need to actually “punch” it) and reshaped into a ball. Grease the bowl once again, turn, cover and repeat the rising process for about another hour. Turn the dough out onto a lightly floured surface. Cut the dough in half. This will make two nicely sized loaves. Set one half aside and place the other half in front of you. Use a pastry cutter to split into six evenly sized pieces. Roll each of these pieces into a rope-like shape, making sure to taper the ends. Should be about 8 inches long. Pinch the ends and tuck under. Repeat with the second half of dough. Sprinkle some cornmeal over a large parchment-lined baking sheet. 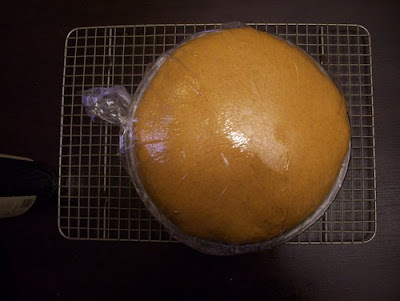 Place the two loaves on the sheet allowing enough room on each side for them to rise. If necessary, use two baking sheets. Once risen, brush with another coat of egg wash. (Be sure to be even more gentle now as the braids are very delicate right now.) Bake in the 350 degree oven for about 40-45 minutes. Let cool on wire racks before serving. Baking bread at home is much easier than some people think, but once you get the hang of it you might find that you’ve encountered the much more complicated task of storing the bread. Different people swear by different approaches, but I find that it is always best to leave the bread out of the refrigerator. That simply will dry it out and you’ll find yourself with two rapidly-stale loaves smelling slightly of eau de fridge. If you don’t think you will be able to consume all the bread within 2-3 days (not that you should be ashamed if you do manage it...), you should slice it and wrap well in plastic and foil, then freeze. For immediate eating, wrap either in plastic wrap or place in a brown paper bag and store in a cool dry place on your counter top. (I have a friend who recommends storing crusty breads in a pillowcase, but I’ve yet to try this approach.) Home baked bread can be quickly “refreshed” by popping into a 350 degree oven for a 1 or 2 minutes before serving. And of course, once the bread does go stale, it’s time for French toast and bread pudding—would that we all could meet such a lovely, lovely fate. 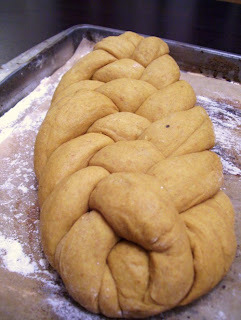 Gorgeous challah! I've got to try this recipe. 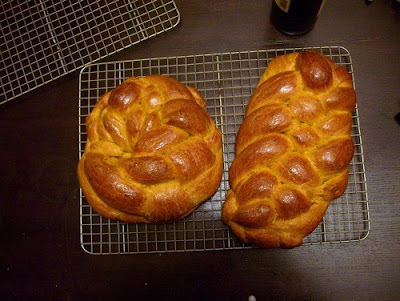 I love good plain old challah, but I recently had a honey challah that was amazing. I bet your recipe is awesome! I'll have to try it sometime. Thanks for sharing. My husband has a new found obsession with baking bread...and not the easy, throw in a bread machine kind either. The sourdough that takes 2 days kind. I think we need to try this recipe soon...it looks delish! "eu de fridge" hahahahaha! 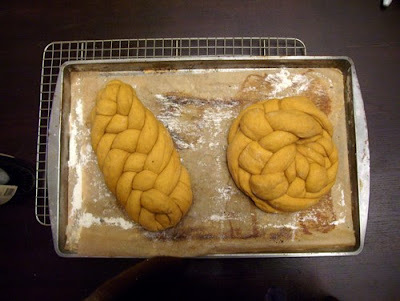 Gorgeous loaves...I've been wanting some challah, and this recipe sounds perfect. I've actually never had challah! But I'll make this and try it. It looks wonderful! I'm still confused about the braiding. You only braid from the right? Hi Amy, Yes, you braid only from the right. You'll see...it will all tuck in and look lovely! Be sure to occasionally pull the pieces together as you're braiding! 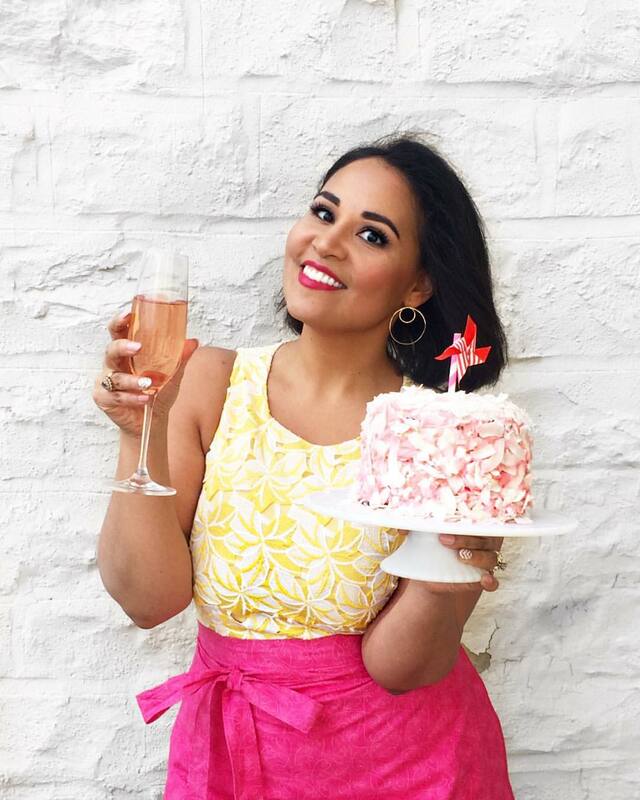 congrats on the cookthink questionnaire! I should really make challah again: I like mine with dried cranberries. let me just say first of all- i made your coconut flour brownies, and loved them. i've made them a few times- since i feel so much non-guilt about eating them. tee hee! ok- this pumpkin challah recipe looks great and i want to make it BAD- but, i have two questions- how much sugar do you put in it ( i don't see it in the ingredients) and do you use white or brown? also- when do you add the pumpkin and the spices- if i'm not mistaken, I didn't see those steps in the recipe. Please tell me your secrets- I must have this pumpkin challah french toast this Sunday! And the pumpkin goes in with the eggs and oil. The thing to remember too is keeping an eye on the dough as you're adding flour to it. Sometimes it will seem sticky but once you start kneading it will come together nicely. Add the flour in bit by bit until you get a nice springy but not sticky consistency. Your challah is gorgeous and I can smell it baking from here. Lovely! Just because something is good doesn't mean it can't be just as good but different. It's why I love running/walking with my guy, we don't always stick to the sidewalk. You might like my Southwestern Brioche. surely there's something not quite right about suggesting bacon and challah as the perfect combination? also, why the cornmeal on the baking sheet? Cornmeal (or semolina) on the baking sheet gives the bread a lovely little crunchy texture on the bottom. It's optional, but I like the texture and flavor it adds. 1. You still don't say when to add the cardamom, cinnamon, or ginger. 2. The description says "hints of nutmeg" but there is no nutmeg in the recipe. That said, it smells delicious and I'm hoping for the best!! Thanks! Thanks for pointing that out! The spices (including nutmeg!) should go in with the pumpkin. I'm guessing you figured it out when you made it. I've updated the recipe to reflect this. Thanks so much and Happy Thanksgiving! I made mini-challot for Thanksgiving with this recipe and they were a hit. The leftovers went into a french toast casserole, which was equally amazing.